I'm Not Skinny: 1-9 What I'm wearing. Fezes and pearls. 1-9 What I'm wearing. Fezes and pearls. My love for hats isn't really a big secret. I appreciate them, I wear them and I hang them on my wall like art. It's the unique ones that I really adore though. Like this fez that I purchased over the summer from, you guessed it Shop Carousel. I feel like so many people are intimidated by hats...but they are amazing ways to stand out. I threw on my Kelsi Dagger low rise ankle bootie (which really I want to call oxfords with a heel) and a vintage style dress I thrifted a few years ago. Pop on a pair of pearls, and a my Timex and TADA! Fake fancy pants. This is my casual. Here's my OOTD. What is OOTD? Outfit of the Day. Love hats too! I will admit, not sure how to wear them sometimes :s Great find! I love the vintage look! :) You look great. I like women in hats.. my wife doesn't wear them, but she likes other women wearing them.. go figure.. I know a lot of ladies like that! I don't know why they never think hats suit them, but they usually look great! Loving your OOTD! I'm not much of a hat wearer but you look great! Your OOTD is great! I am one of those intimidated by hats. I just don't have an eye for a hat that would compliment my face. I love the idea of them though...and my Mom used to hang hats on the wall as a decorative theme...and it looked really cool! You've just got to find one that will get you hooked! I'm glad someone else hung them on the walls, I just want to see them all the time! I am intimidated by hats. I never feel like I wear them well. You definitely do though! That Fez is a fashion risk (for me anyway) but you pull it off! I couldn't turn away from it! There's something about vintage velour and the color of it that BEGGED me to buy it and wear it. The outfit is amazing! 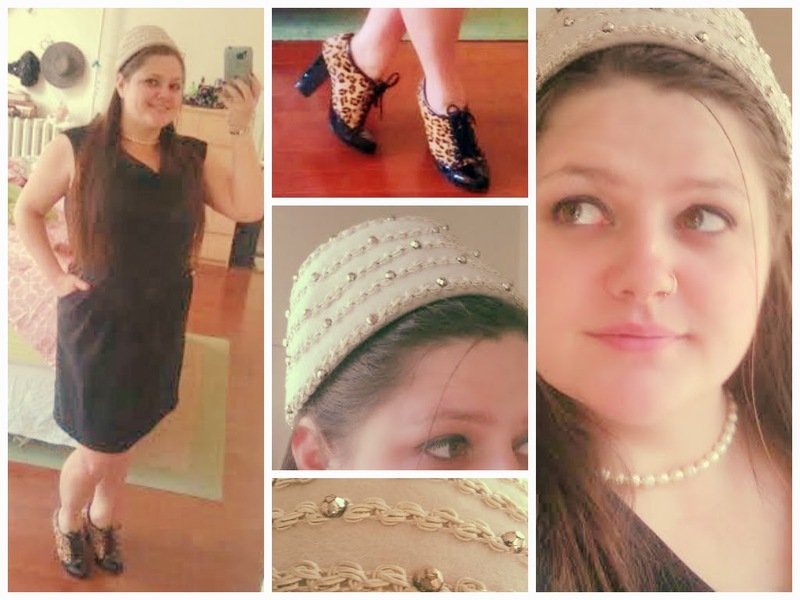 I love everything, the shoes, the pearls and, of course, the hat. You are right, hats are amazing and it's a shame they are not more popular! I have never seen a fez on anyone but a Shriner! How cool is it that they make one that actually stylish?! I'm actually learning to love hats. I always thought the looked goofy on me, but now I love them. It's seldom that I've seen a fashion fez, so when I do, I HAVE to have it! This one is from the 50's I believe the condition is wonderful. I've gotten away from wearing hats and you look great with that unique fez. What a cute hat and you look great in it. I have a small head lol hats never seem to fit right on my, I think I look like a child. I love to see them on others though. That outfit looks so good on you. I am all over animal print! How are the shoes? i'm not very good with heels - but these ones are cute! As far as balance goes, they are good, they have the wide back heel and walking in them is similar support to wearing a wedge. I did have to stretch them, however. The toe area was more narrow than my already narrow feet so I used a shoe stretcher in them for a few weeks. Now they are 100% comfortable and I love them, I too have a weakness for animal print. I love animal print! And pearls are totally awesome! I just think pearls makes a woman look so sophisticated. I loved your outfit. Your outfit is much better with pearls as it's best part. Pearls original or fake carry kinda sophistication in their appearance and adds same to the personality of the person who wear them. I agree! I love pearls they really do class up a look. I don't really wear hats because I don't look good with them but this one looks cute! I'm an animal print lover though, I wear animal print all the time and LOL to that "What is OOTD? Outfit of the Day." haha. You're awesome! I wish I looked nice in hats, and you sure do. That is such a fun style and your booties are adorable as well! That is such a cute hat. I can never pull off hats well but I wish I could! I love the whole outfit! The vintage style dress was complimented by the lovely fez. I salute women like you who stand up for their own style and personality!